A plug-and-play, silent, fume-free generator for emergencies, camping, or wherever you need power. These days, you need to have a power supply with you at all times, wherever you are. Including out and about. GOAL ZERO develops powerful, portable and durable solar energy solutions for any field of application. GOAL ZERO makes sockets a thing of the past. The Goal Zero Yeti 150 Solar Generator is a gas-free source of portable power to keep lights, phones and laptops powered on through any situation. The Sun: The Goal Zero Yeti 150 can be charged by connecting a compatible solar panel (see linked products). 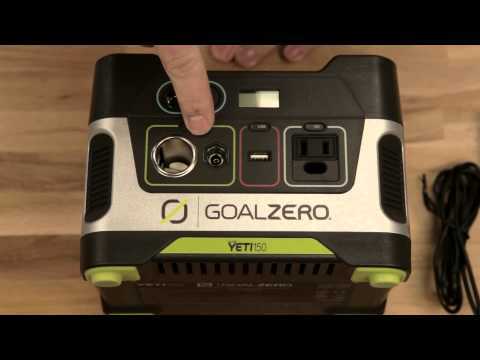 Wall:The Goal Zero Yeti 150 can be charged by being plugged into a regular wall outlet. Car:The Goal Zero Yeti 150 can also be charged by plugging into your car 12V adapter. Plugs: Multiple Plug compatible inc US / UK / Euro: Supplied with a UK plug to charge the unit (3m cable length).